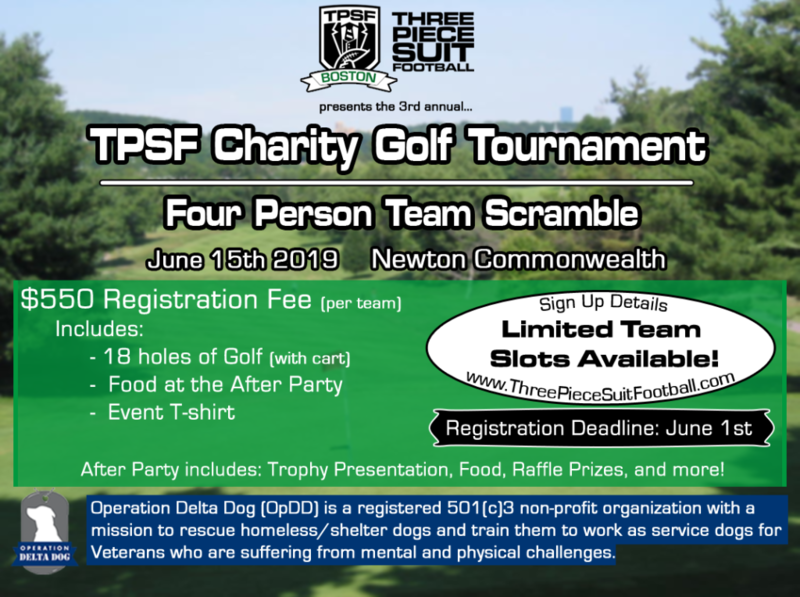 TPSF Boston is having our 3rd annual charity golf tournament at Newton Commonwealth on 06/15/2019! Tee times start at 9:30 AM SHARP and the order will be determined by the order teams register. There will be a bidding contest to determine the team which tees off first. The registration fee is $550 ($137.50 per player) and spots are limited to 20 teams so be SURE to register soon! Click here to register a 4 person team online! Click here to download a Team Registration/Sponsorship Form. This form can be used for Team Registration or for a hole sponsorship and can be filled in and brought to the Last Drop bar or 6 South Crescent Circuit, both in Brighton, with payment for Teams/Sponsors who do not want to pay online. Don’t want to play? Sponsor a hole! Hole Sponsors will have their logo present on a designated hole on the course. We are also looking for volunteers! Registered teams get a team photo, TPSF Golf tournament T-shirts, 18 holes, a golf cart and free BBQ (Ribs, Sausages, Chicken, Burgers, Hot Dogs) provided by Hormel Foods at the after party at The Last Drop! May the best team win! The after party will start around 5:30 PM…PLEASE BRING FRIENDS! There will be a Trophy Presentation and many other Raffle Prizes! All proceeds go to our charity Operation Delta Dog! Good luck golfers, and thank you for being part of such a great event and donating to a special cause! Custom made TPSF golf shirts, a foursome at the Newton Commonwealth golf course with swag. A golf scramble is a format for golf tournaments where two or more players form a team to play, with the rules emphasizing fun without the pressure of players keeping individual scores. Each player hits a tee shot on each hole, but everyone plays from the spot of the best shot, subject to certain criteria. Rules for playing in a scramble are informal, with tournament organizers modifying basic rules as they wish. The scramble format is not covered under the official Rules of Golf. Each member of the team tees off from the starting hole. In a scramble tournament, the team’s opening hole could be any hole on an 18-hole course, depending on the assignment by tournament organizers. Players can tee off with the golf club of their choosing—not necessarily a driver. The best tee shot is chosen through the general consensus of the scramble team. The group can decide the best tee shot based on any criteria they choose. Usually, the best shot is the longest drive that lands in the fairway, though the team may choose a long tee shot that landed off the fairway in the rough if there is a decent lie. The spot of the best tee shot is marked with a golf tee or ball marker. Players must pick up their golf balls and hit from within one club length of the newly marked spot. Team members continue selecting the best shot until one player hits the ball in the hole. The team score is the total of the best shots. Team leaders, please have your team at the golf course at least a half hour before your tee time to take photos, get player bags. Player shirts will be passed out at the after-party at the Last Drop in Brighton. Stay tuned. All additional details of the golf tournament will be posted here.